Technique - How to Photograph Flatlay. Flatlay photography, where something is photographed flat and from above, has been around for a long time but just recently it's popularity has exploded. Thanks probably to photographers who use Instagram, where this style is almost a phenomenon. Just about anything can be photographed in this way, food, make up, commercial products, clothing, you name it, someone will probably have shot it in a flatlay. In this article we're going to take a look at a number of areas that will help you take great flatlay images. It doesn't matter what camera's used to do this, it can be done on a smartphone or a DSLR. Flatlay is all about the subject, the composition and the light. Get those parts right and any camera will capture a great image. Lets take a look at those important areas and a few additional components that go in to shooting a great flatlay photograph. There’s no need for expensive lighting setups. It’s very easy to use window light. I have done just that in the example flatlay shot you see here. The window is at the top of the frame. The quality of the light coming through the window will depend on the weather. Ideally a cloudy day as I had for this image will offer soft light flattering the subject with gentle shadows. If a harsh look is what you’re going for then using direct sunlight will give very dark sharp shadows. It’s very possible to use bright light and still achieve those soft shadows by using something like tissue paper or semi-translucent material to take the harsh edge off. I use a reflector (see the setup image) made from a strong, translucent material which gives me a very soft light. Ensure any filter material is big enough to cover the whole flat-lay as the same light should cover the entire scene. You will always have shadow so ensure its where you want it to be. Shadow in the wrong place can upset the composition or hide important parts. As the window was at the top of the frame the shadows fall directly down the scene which offers additional balance. When light falls across the composition at an angle this can look annoyingly 'not quite right' so I like to keep the shadows in just the right place. If you only have a single light source like a window, use reflectors to bounce light back on to the important parts of the composition. Even white a4 paper will do. I used just this to reflect some light back on to the coffee beans at the bottom of the shot. As they're furthest from the window light source they could have ended up being very dark so the reflected light lifted them a little. The light will set the mood. Bright and fresh or dark and moody? Use the right light with the subject for maximum impact. If the subject is about summery drinks or make up, then the image isn’t going to come across very well if the light is dark and moody. However if the subject is a dark,richly coloured cake then a darker lighting set up might emphasise the colour and texture of the food. Experiment to see what works and what doesn’t. Try various backgrounds to match the subject. Wood with texture is popular but how about using wallpaper? Some papers have a pattern that mimics wood, it looks realistic and it’s a lot easier to lift and store. Just remember to keep it flat or rolled up to avoid creases. A great flat-lay usually has a colour palette which harmonises the colours across the composition. This makes the whole thing very easy on the eye. There are books available such as Jim Krause’s Colour Index which has pages of colours that work together. In our example the colour palette is all about that coffee colour with the other parts of the composition chosen for their various harmonious hues. What’s the reason for taking the picture? Ensure that comes across. If it’s about make up then the picture should shout make up. Be bold with your choices of colours and props. Use props that are appropriate and work with to the subject. Everything in the image should have a reason to be there. Don’t use items that aren’t part of the topic of the image. In the flat-lay I have set up here, a nail brush would have looked out of place. Don’t compose too loosely or the props will look lost in the image. Unless the composition demands lots of space. A great aid is the ‘rule of thirds’, where important parts of the image are located on the intersections of lines that divide the frame in to thirds. That means two lines running horizontally and two running vertically. You don’t have to use this technique but it’s a good one to start with and if you find there’s a better composition to use then go with it. For the coffee composition I not only put the coffee cup on one of those thirds intersections, I also used the shapes of the components to create lines that point towards the centre of the image. These take the viewer's eye into the centre and then out again along the other lines to explore the picture. Even the handle of the cup is positioned to do this. Experiment with different looks and layouts. Nobody ever made waves by being the same as everyone else. There isn’t a right way or a wrong way. It just has to look right. Take time to get the perfect composition. Flat-lay is afterall about nicely arranged subject matter so get comfy and get it right. Stabilise the camera. It doesn’t matter how this is done just as long as the final image is sharp. If finances allow, buying a tripod will make it very easy to achieve a rock-solid support for the camera, be that phone or DSLR. Because the camera was mounted on the tripod I could use a low ISO for maximum image quality and a small aperture for maximum depth of field. The setting for our flatlay image is ISO100, F20, 20 second exposure. That's a long exposure! For this shot I've used a Manfrotto 055 tripod which has a centre column that can be extended out over a composition. (Note if you're interested in buying the Manfrotto 055 tripod, it doesn't come with a head, that's usually an extra). I prefer to use a 50mm standard lens as it won't distort the image like a wide-angle and I want the composition to look like I see it with my eye. The 50mm offers that kind of perspective. Note that as the lens is facing straight down, the focus ring can slip and lose focus if it's set to manual. When using manual I'll find the focus then apply a little bit of loosely tacky masking tape to the focus ring to hold it in place. Understand how white balance works with your camera. If the image is for commercial use then accurate colours are essential. Take a grey card shot to use for white balance adjustment during editing. If the image is taken using RAW then the white balance can be adjusted in post. If you intend to shoot jpg, then it might best to ensure the white balance is accurate when taking the picture. RAW offers the maximum amount of data to edit. Jpgs don’t contain as much info and aren’t as flexible when it comes to post processing. When shooting a flat-lay the focus is important but depth-of-field is not critical, however by using a small aperture, F20 for our example, a greater depth of field is achieved, everything should be nicely in focus. The beauty of using a DSLR, Canon 5D mk3 in my case, is that I can control the aperture, ISO and shutter easily. For someone using a phone it's a little more difficult. There are though apps available giving the photographer access to just these same kind of controls so they become a much better tool for the job. When composing the props, work to the frame size and format, i.e. portrait or landscape. Set up your camera and work out the area your composition has to fit in to. I setup the composition first and then put in anything that needs to look ‘just made’ right at the end. 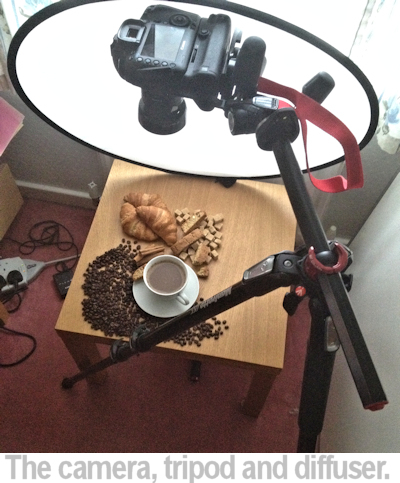 In our example the coffee cup was empty whilst I set this up, then when I was happy with everything I made a coffee, put the full cup back in the scene and took the picture. I try to keep the layout clean of dirt, hairs, etc especially when the image features food. Nothing ruins a composition more than unwanted human detritus! Be prepared to put some time in to it. Not all compositions will work so some adjustment and reworking may be necessary. At times it will be fiddly as little details have to be ‘just so’. Sometimes achieving ‘just so’ can be painstaking but there’s no time limit then why not get it right? 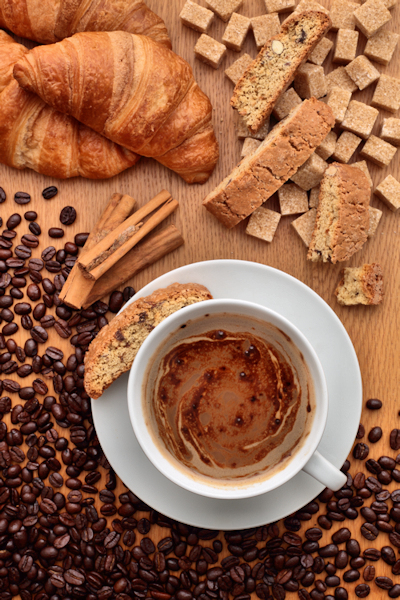 In the coffee image above I was positioning individual coffee beans and sugar cubes to achieve the look I wanted. One of the secrets to a successful flatlay is making it look effortless and not what happens in reality, where the photographer (or stylist) spends hours putting everything in the right place. The best examples look like they just landed there naturally. Easy eh? I eventually took 28 images and I was only really happy with the 28th frame. I also made 3 cups of coffee to get the best chance of the 'fresh' look. There are loads of great examples of flat-lay imagery on Pinterest. However, don’t copy but be inspired. Create your own unique work.